This is the first game in the Red Dead series. For other games in the series see the Red Dead category. 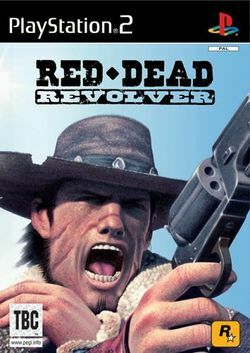 Red Dead Revolver is a western third-person shooter published by Rockstar Games and developed by Rockstar San Diego. It was released in North America on May 4, 2004, for the PlayStation 2 and Xbox. The game's development stalled when it was dropped by Capcom. In 2002, Rockstar Games purchased the game and expanded on it. Changing from an American western to a Spaghetti Western allowed the developers to add more blood and over-the-top characters. The lead character appears to be an amalgamation of various Clint Eastwood-inspired characters from assorted movies, mainly the Man with No Name character, with whom he shares many similar traits. The game reproduces a "grainy film" effect and uses music from various Spaghetti Western films, including those composed by Ennio Morricone. This page was last edited on 17 October 2010, at 15:16.